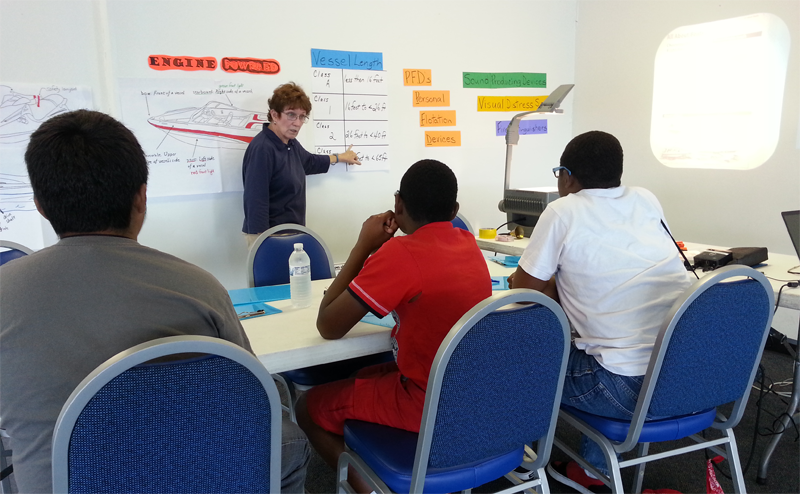 Celia Oprinovich , Curriculum Coordinator for the Indiana Sailing Association, teaches students the fundamentals in the “Boating Basics – Brief Course” programming at the East Chicago Marina. The Indiana Sailing Association has been working on the development of what is being called the “Boating Basicis – Brief Course” which is designed to align basic boating curriculum for middle-school age students, and is based upon the official Indiana Boating Safety Course which is offered through the Indiana Department of Natural Resources. The course is being offered to East Chicago School students who are part of the St. Joseph’s Carmelite Home in East Chicago. The goal is to provide these students with a unique opportunity during the summer and also serves as an opportunity to refine the curriculum so that it could be scaled to accommodate more students in future sailing seasons. “We are always trying to adjust and adapt the materials we teach on shore so they are compatible with the experiences the students have on the water,” said Celia Oprinovich, Curriculum Coordinator for the Indiana Sailing Association. The Indiana Sailing Association has had a long history of working with the East Chicago Schools since 1989. The goals for 2015 sailing season include new models of implementation for the programming that has recently been developed to provide new opportunities for students within the East Chicago Schools.